The father of a prospective student here at Goshen College, who shall remain nameless, recently showed me on video how his daughter took the plunge. That is, she leapt, on purpose, off an 80-foot tower in a death-defying act of insanity, uh, I mean, bravery. Her dad recorded it all on camera, including her mother screaming at the top of her lungs until she knew for sure that the bungee cord had, in fact, worked flawlessly and her daughter was safe and sound on the ground. Here at Goshen College, we’re thinking of dispensing with all other admission criteria except bungee jumping. If you can leap 80 feet into the abyss with nothing but a little bungee cord strapped to your ankles, you are in, baby! There’s something to be said about a prospective student ‘leaping in faith’ to come to Goshen College. 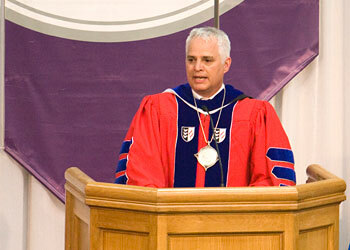 So, why not also in their graduation, your graduation from Goshen College? An 80-foot jump, headfirst, for a diploma? Now, that’s a thought. Perhaps, many of you — whether you’ve been on the traditional undergraduate track, or you’re part of the degree completion program, or in the masters’ degree programs — many of you feel like you’re about to take a scary, 80-foot, death-defying leap into the rest of your lives. If that’s how you feel, you are probably ready to graduate. I’ve found it to be true that God’s will for a person’s life is often, though not always, only known clearly and unambiguously in hindsight. Going forward, one’s life often appears, as the Apostle Paul says, “through a glass, darkly,” like leaping into a dimly lit future. Even those of you who have a well-developed plan, a straight line from graduation to a dream job or grad school or voluntary service or marriage or parenting – your logical, methodical small step forward today may in hindsight 20 or 30 years from now look a lot like the giant leap that it is destined to become. Two years after graduating from Goshen College, my wife, Terri and I, packed all our belongings into our little Toyota Celica and headed nearly 2,000 miles to California for what we thought were just a couple of years of graduate school. Never in a million years did we imagine that 26 years later, not only would we still be in California, but we would also be packing our bags for the only other time we drove across country to return to Goshen College, for me to serve as its 14th president. The New Testament equivalent of Abraham and Sarah’s leap of faith and landing in hope are those several times when Jesus goes up to his would-be disciples and says, “Follow me.” He doesn’t say where or for how long. He simply says, “Follow me.” Again, the text in Mark’s gospel is lean and sparing in its description of their response. It simply says, they dropped their nets, or in Levi’s case, left his tax-collector’s booth, and followed Jesus. And the rest, as they say, is history. What started out as a small mustard-seed-of-a-group, a truly insignificant movement, blown here and there by the wind of the spirit, over time would be transformed into the largest of trees, branches spread wide, a place of rest for world-weary souls. Such is the kingdom of heaven, Jesus said. It’s never too early to leap in faith and land in hope. Little baby John the Baptist, leapt in his mother Elisabeth’s womb, when Mary, the mother of Jesus, came to visit. His was a leap of faith into a hopeful future, when Christ the Savior of the world would be born. It’s never too early to leap in faith. It’s also never too late, to leap in faith and land in hope, either. Abraham and Sarah, you recall, were not exactly “babes in the woods,” but senior citizens, when God called them to do something radically new and different. Yet they were willing to take the plunge of faith. No one, absolutely no one, especially Simon Cowell, that acerbic judge and creator of “American Idol,” thought Susan ready for prime time. But then, less than 15 bars into the song, “I Dreamed a Dream” from “Les Misérables,” the audience started clapping. A few measures more and they were on their feet cheering. By the end, there wasn’t a dry eye in the house, including my own watching on You Tube. Susan Boyle had taken a giant leap of faith and landed in hope. She dreamed a dream, took a leap of faith, and landed in hope. In one giant leap, she blew down some walls of cynicism. She toppled blockades of hypocrisy. She battered down barriers of mean-spirited prejudice. And she landed in hope for every one of us. Whether graduates or not today, whether you’re young or old, child, parent or grandparent, do not hesitate to leap into life by faith. God will be with as you, the text says, as you land in hope. God will be with us when we leap. And better to leap and fall than never to leap at all. Is that a saying? It should be. In his best-selling book, Blink: The Power of Thinking Without Thinking, Malcolm Gladwell describes a kind of intuitive, instinctual thought that comes to us “in the blink of an eye” that often is more accurate, more right, more helpful, and successful, than long drawn-out cognitive analyses in which every possible doubt is accounted for, all pros and cons are assessed, all arguments are settled. He argues that many of the best decisions made by the best leaders, the most successful, and influential people in the world are those who can’t explain to others, but happen in a blink-of-an-eye of rapid cognition. It’s something that happens from deep inside us. Gladwell is cautioning us not to become immobilized by the complexity of our decision-making processes, as important as those may be. He invites us to trust that deep place within each one of us, where “deep calls to deep,” that place within, where rapid cognition fires up, where happens a kind of rationality that somehow knows beyond words, beyond mere reason, beyond our doubts, beyond our fears, beyond our domesticated spirituality, beyond life itself, that when God says, “Get up and go,” when Jesus says, “Follow me!”, when the Spirit says leap into the pond — there and then, here and now, day by day, from that place deep down in our intuitive gut, we leap by faith into our future destinies. I pray today that each of you go from this corner of God’s universe into every continent of this world, that, with God’s help, whatever you do, you will help in the awesome calling of healing the world peace by peace. Call it wild. Call it adventurous. Call it risky. Call it a leap of faith — a leap of faith, yes, but also call it, possibly, the most transforming adventure of your lives. So, leap. Leap in faith. Take the plunge. With God above and below you, and all around you, you will, I promise, land in hope.